Ok, friends. I need to be serious for a minute. 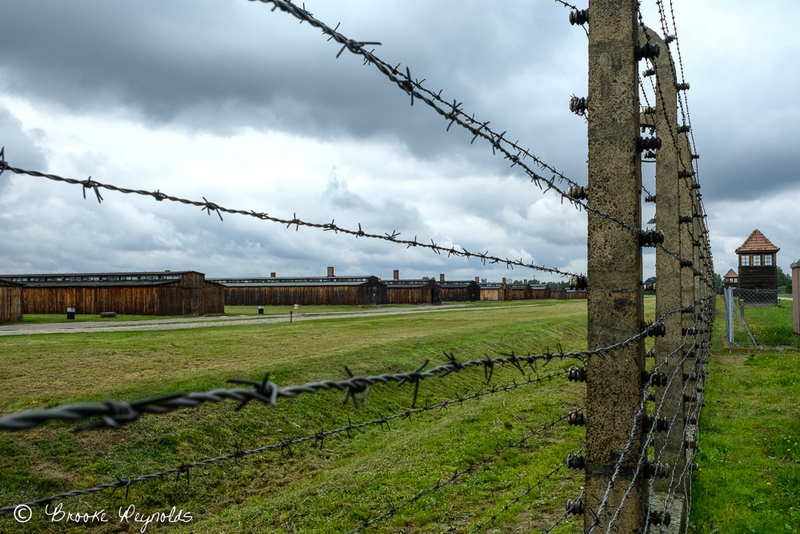 I’ve seen nearly all the horror movies out there and visited several horrible places on earth—living conditions of neglected and abused people that were disturbing on multiple levels—but nothing prepared me for Auschwitz. At first, I thought I didn’t need to go there. I thought I knew enough and I didn’t need to subject myself to that. Now I know that, yes, I do. Yes we do. We need to keep our eyes open to what humanity is capable of so we don’t let history repeat itself. The people who were there want their silenced voices heard. Seeing this place with my own eyes shifted something inside of me. I want my blog to be mostly a cheerful place, but I also want there to be truth and reality. Because, the world is full of yin and yang. It’s not all rainbows and cute animals. Although I choose to try to surround myself with that as much as possible, I also choose to speak up against oppression, destruction, and atrocities so that we can still have rainbows and cute animals in the world by protecting the earth, the animals, and the people. Do we change the world by putting on a blindfold and ignoring anything evil that isn’t affecting us directly? Or do we change the world by being radically aware of history and truth so we can evolve and move forward with humanity? I’m disheartened to hear that most millennials don’t believe in or don’t know about the holocaust. What! I imagined a shield of protection was around me as I walked onto the site of the one of the most gruesome and largest mass genocides in our recent history. It was raining and cold that day in Poland, adding to the gloomy vibe. I braced myself and stayed close to Jerrod, not knowing how much of an impact this experience would have on us. I felt the heaviness in the air as we walked up to the eerie, red brick buildings. We were handed audio headphones and assigned a guide with a group of at least 20 other people. I admit, I wasn’t prepared for the detail the guide would go into about what happened in the years of 1940-1945. Years that my grandparents were alive in. Years that were not so long ago. Years that were a living nightmare for millions of people—anyone who didn’t fit the profile of a pure white Aryan. It started with the Political Prisoners, but then the Nazis started rounding up Jewish, gypsies, homosexuals, Jehovah Witnesses, numerous other races, and anyone who spoke against the Nazi regime. 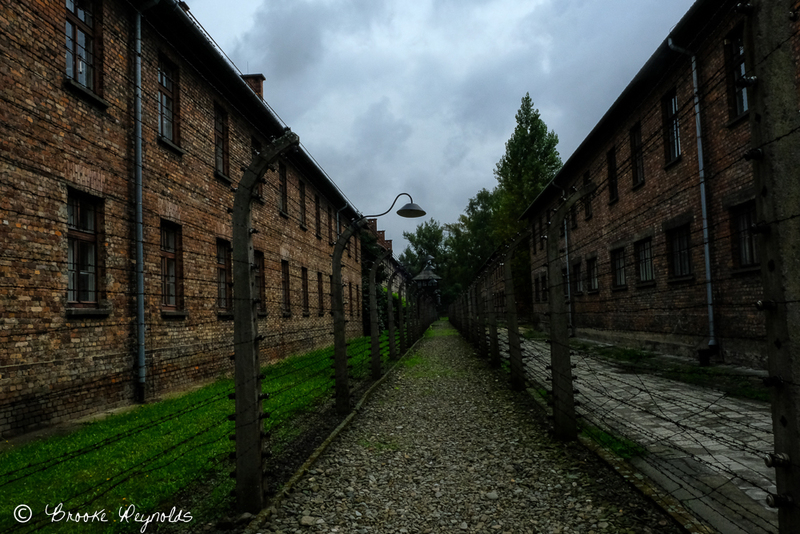 While the majority of prisoners in Auschwitz were Jewish, many were Polish, Gypsies (Roma), and Soviet POWs. 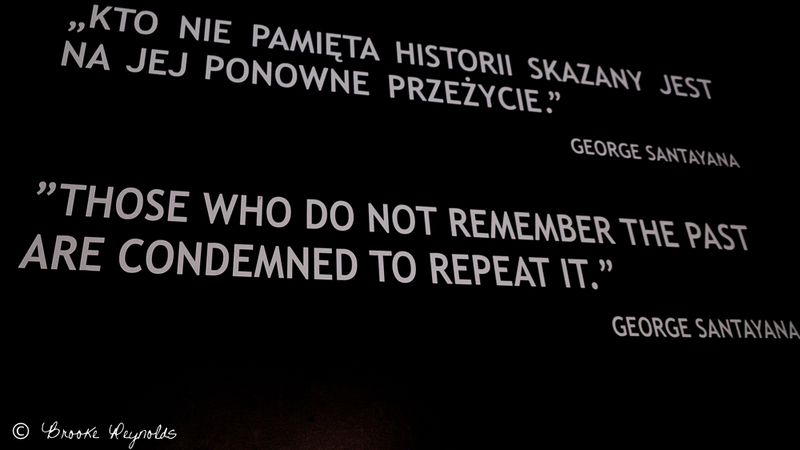 We must remember that since it was mostly Jewish sent to Auschwitz, non-Jewish people thought they were safe. But no one was safe. One man who drew in crowds of people based on fear of people different then themselves and he made them feel superior with their Nationalist Pride. The constant propaganda turned the white nationalists to have disgust for any other race than their own. These people became convinced that all others must be wiped out. Yet when the chaos became reality, most people living at that time didn’t know the mass murder in the concentration camps was happening. The rumors floated around, but many people thought it was a ridiculous rumor. They thought people were just being rounded up and jailed. They thought it was fake news. 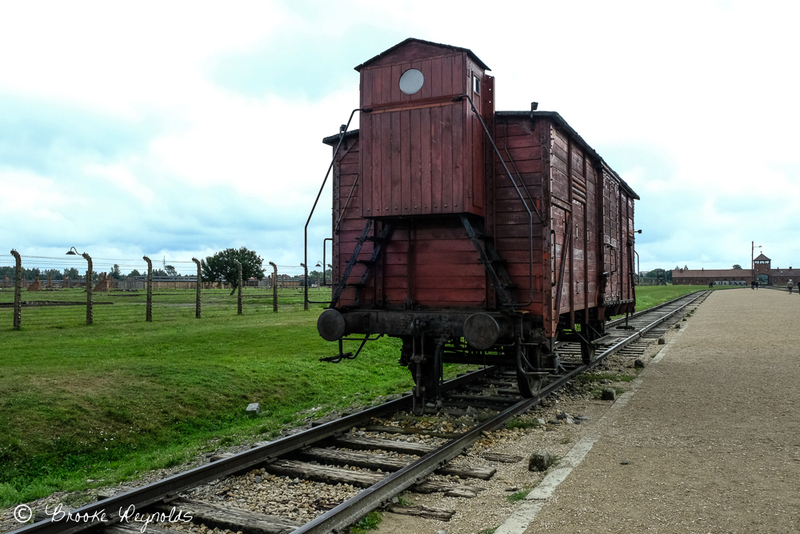 They never imagined that thousands of people a day were being tossed into a massive gas chamber and thousands more were on their way in the railroad cattle cars. Seeing one of those wooden railroad cars still attached to the seemingly endless railroad will haunt me for the rest of my life. Entering another building, we were rounded up into the very same rooms that the victims were rounded up in. Except we were fully clothed, we were not starving from traveling several days with no food or water, and we were not fearing for our lives and the lives of our loved ones. I imagined their pain and suffering. 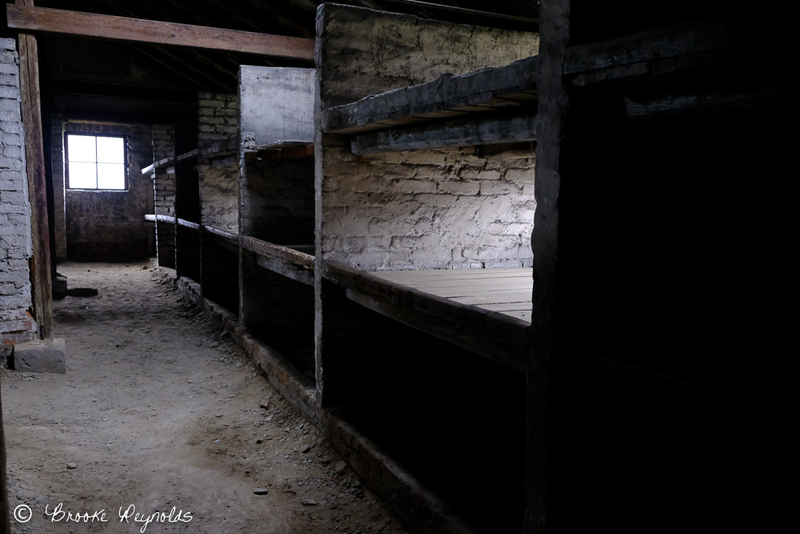 I probably let my guard down too much as we walked down some narrow, dark staircases where the stairs were worn down to nearly a slide from the mass amounts of people that must have been herded down those very stairs into the basement where they were tortured. It was pure hell to see. There is no denying the atrocities here. It felt like my heart split open and I couldn’t breathe. OMG what did these people go through? This is hard for me to write and I’m sure it’s hard to read. 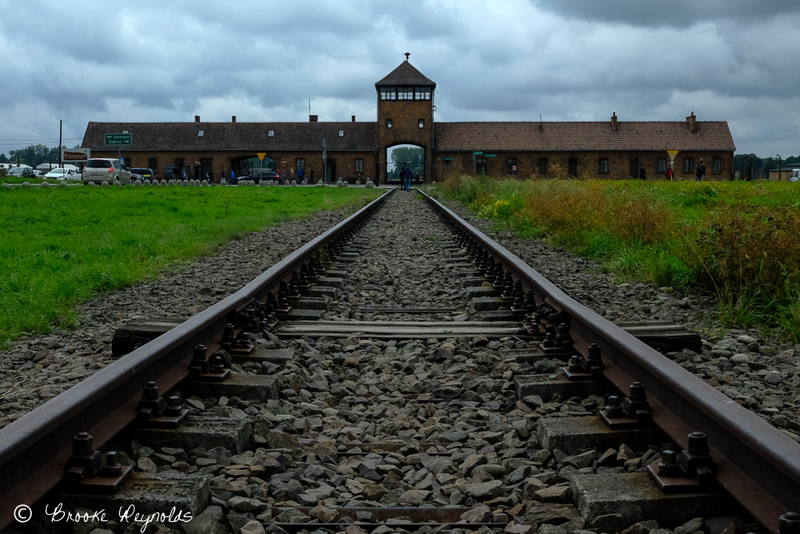 I stayed up for 3 sleepless nights after going there, just traumatized by what I had seen and heard in the walls of Auschwitz. 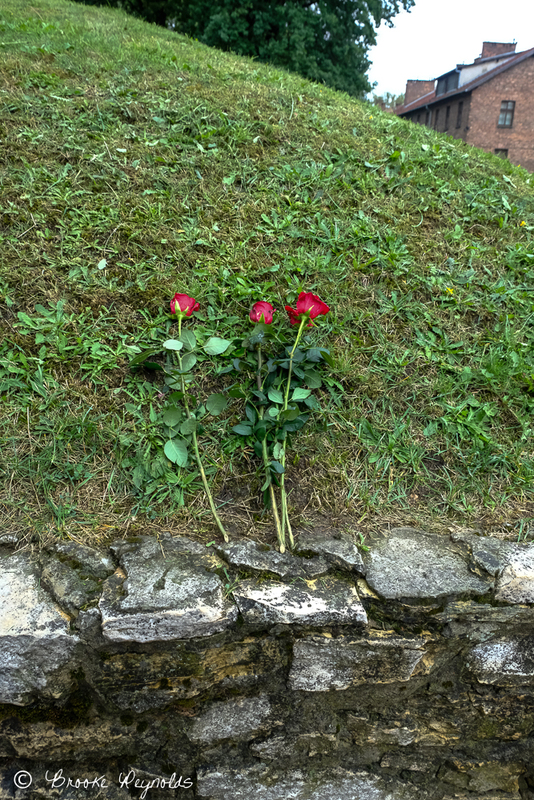 It took me a long time to be able to write about this experience, and I feel guilt because I know I can’t even begin to imagine what the people who actually went through it felt. I don’t want to feel that way. I don’t want ANYONE to feel that way. EVER AGAIN. We were brought through building after building, viewing the remains of people’s shoes, suitcases, and hair. Yes, hair. It was hundreds of pounds of human hair behind a window and I felt nauseous and completely numb from shock. Then we seen walls covered from end to end with photos (mugshots) of the innocent people brought there. I looked into their eyes and I felt their pain. I felt anger and shock and fear from humanity. This is the result of groups of people turning against other groups of people. We can’t do this. We need to fight this. We need to unite against bigotry and hatred. Standing in the field of Birkenau where rows upon rows upon rows of brick buildings continued on like animal slaughterhouses, it is a sickening sight to behold. Because that is absolutely what it was. I nearly threw up due to the ancient lingering smell of death in the air. I imagined humans and I imagined animals, none of which should be treated this way. Rows of human slaughterhouses, very similar to animal slaughterhouses. Inside the women’s “Death Barrack”. 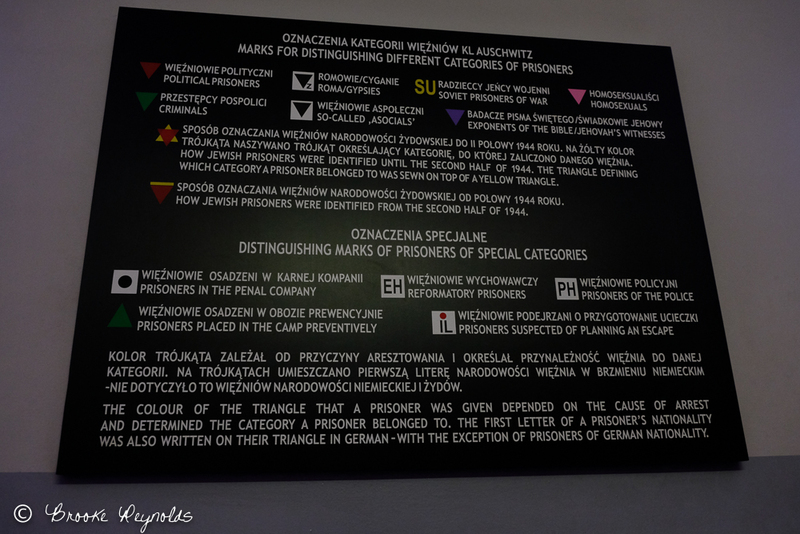 They were thrown in here before they were sent to death, but many died in here. We must not harm like this. We must not kill. A fire grew larger in my heart that day. It is a fire that is a fist of resistance that will always fight FOR the oppressed and the innocent. It is also a fire of love of the world and what we must protect—each other. All Earthlings. 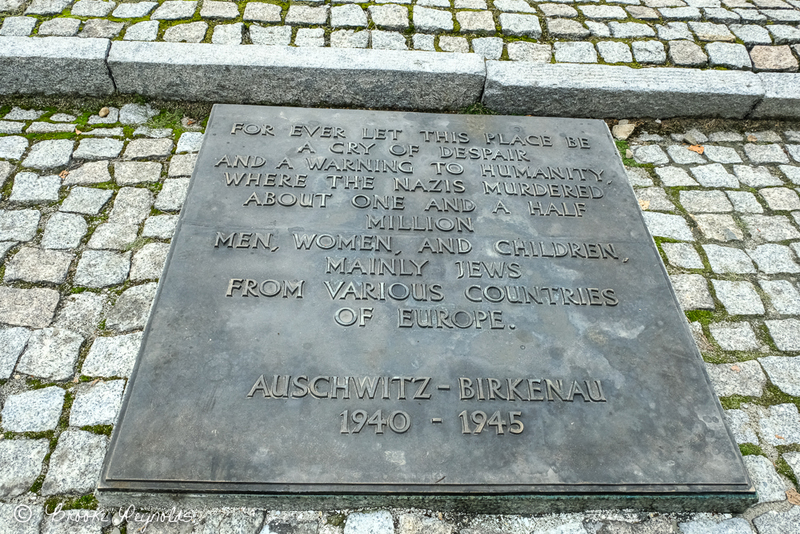 I numbly walked on while the guide told us about the several people that were herded at a time into a cattle car for a 9 day hell-ride to Auschwitz. They had no food or water and were standing up the entire time. When they arrived, they had no idea what was in store for them. They were happy because they were finally out of that wretched wooden crate and could move their legs. But the minute they got out of the crate, the family members were looked up and down and separated according to health status. If they were incapacitated, they were sent directly to the gas chamber. If they could still walk, they were sent to the workhouses. Sons cried out for their mothers. Fathers cried out for their sons. One son said he was angry because his father was separated into the group that said they would be taken to take a shower. Why did his dad get to take a shower and not him? He turned away in jealousy and didn’t say goodbye to his father. Later on, in the work field, he found out what “shower” really meant. It was the gas chamber. Not saying goodbye to his father was the biggest regret of his life. The numbers of people who died here like this? I can’t wrap my head around it. I can’t. It hasn’t stopped. Several mass genocides have taken place since then—in all parts of the world. It is happening right now. We haven’t learned. Will we ever? All I know is that love and compassion starts with each and every one of us—by not turning a blind eye to another’s suffering or letting evil take over by becoming ignorant or complacent. By getting uncomfortable, stepping out of our bubbles, and speaking out when we see harm being done to others—maybe, just maybe we can uplift and change the world to be a better place now and in the future. In Memory of all those who have lost their lives due to genocide.